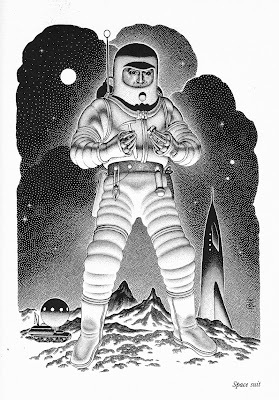 This image of the space suit of the future appeared in the 1956 book The Complete Book of Space Travel. For anyone that has ever been to the Minnesota History Center you may also recognize it as part of the space exhibit there. Yeek! Is he using waldoes, or are are the Fingers of the Future much skinnier than the Fingers of Today? wow, that's a beautiful Virgil Finlay drawing -- cool! Looks like the suits in 'Assignment Outer Space' starring the incomparable Rik Van Nutter, directed by Anthony Dawson ( a.k.a Antonio Margheriti) .